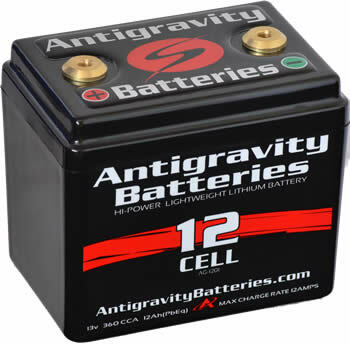 The Antigravity Batteries AG1201 is an extremely versatile high power and lightweight Lithium Motorcycle/Motorsports battery. It can replace the typical 12 Ah Lead/Acid battery with a weight saving of up to 7 pounds while offering much more cranking power. This battery is best used for applications where extreme weight loss and ultra compact size are desired.